Would you, could you, as you flee? Okay, Arvo – take my gyro. Or try to! You’ll pull back a stoody blump! Er … you’ll bull pack a bludy stoomp! Dang it. Unless you hissed my mistory, you know I tend to spout Spoonerisms when someone fights a lire under me. And threatening to fake my Tood does fight that lire. Sheesh. Just take it already. Spoonerisms were invented by Maid Marian when she was bored in Sherwood forest one day. As each member of the merry men came back she called out to them. She stopped when Friar Tuck turned up. Gnome country for slaving men. She’s making slavery eco-gnomically non vie-able. The precious! Tricksy false hobbits, they gives it to us! Note that he’s not lying when he describes her as “slimy” and “self-righteous”. Ok; I give up: what’s being lampshaded? I don’t get it either. He may fail in making Bandit pay, but if his intent is real then it’s no lie. This is a tough call. Slavery is bad, but I hate self righteous people too. But the lamp is glowing bright; thus, it’s a lie. He knows Bandit is better than he is, and he knows he’s not going to make her pay. I’m pretty sure dude knows, deep down, that he has less than zero chance of ever actually “making bandit pay”. He knows, deep down, that he’s a coward who’s not even going to try. The easy path doesn’t lead to hatred. That’s also why Jedi run away to hide on far-off planets when they encounter obstacles. Well, maybe his intent isn’t real. Maybe he’s just lashing out in anger, not really believing that “making her pay” would be all that profitable for him in the end. Sure. Slavery and self-righteousness, how to choose between the two? It’s so tough. The lamp lights up at both his declarative statements. Thus, both of them are lies: He knows Bandit’s better than him, and he knows he’s not going to make her pay. The Lamp reveals the Truth when by illuminating whenever an Un-Truth is told. In the first lamp scene, he might have actually believed they were good friends, but the lamp indicated that they were not. Intention doesn’t matter. The lamp is “throwing shade” by making him look inept. “Your no better!” Lamp: Actually, she is. “I’ll make you pay!” Lamp: Nope, you never will. 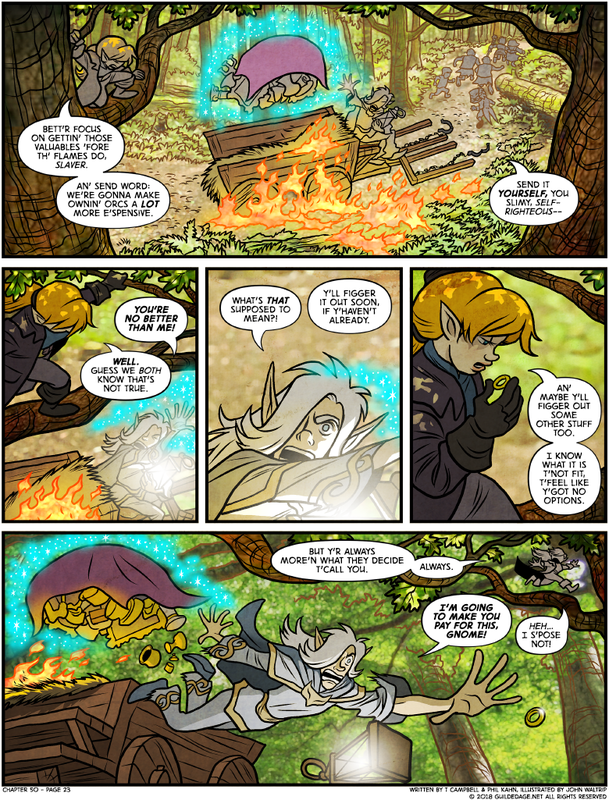 Considering what Bandit is saying in the 4th panel inclines me to think Jemmington was probably exiled by the other Sky Elves who figured they could get rid of their criminal element along with their troublesome youth. The criminal element, Crimium, is on the periodic table between Suprisium and Designon. I just figured him for one of the kids who had a difficult time adjusting to life on the ground. Hence, he’s taking this job instead. Dr. Phil: Jemmington, on May 16th, you said to Bandit “You’re no better than me.” The Lamp of Truth determined that to be a lie. It’s nice of her to fast track his redemptive arc. Why did he swan-dive out of the wagon? I get that it’s on fire, and it looks like Bandit also tossed a ring for some reason, but neither one of those circumstances seems to call for exiting the wagon in such a violent way. It seems pretty clear to me that he’s trying to catch the ring before it hits the ground. Though as to *why* he’s doing that, your guess is as good as mine. I think he’s already levitating both himself and the cargo. Maybe the cantrip breaks if he touches the ground, which would be a frightful bother?